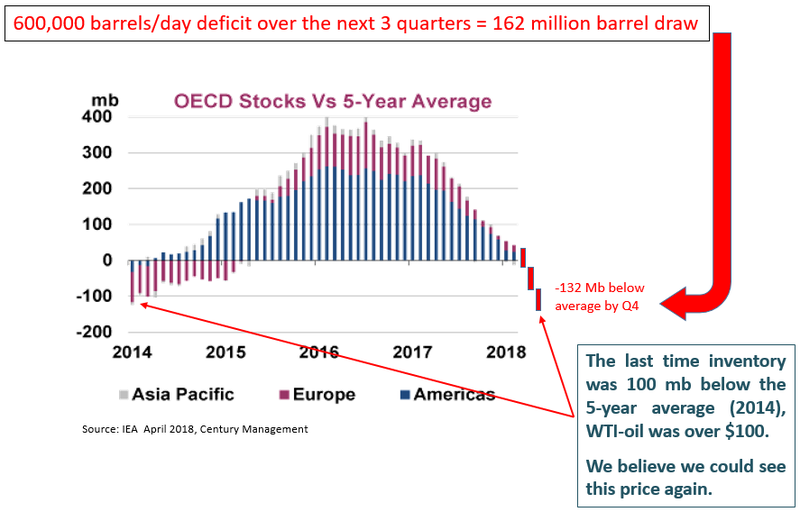 As recent as six months ago, much of the world was convinced that oil prices would remain lower for longer, with most experts anticipating oil prices would remain in a band between $40 and $60 for a very long time. It was thought that demand was peaking, shale had boundless growth, and OPEC (Organization of the Petroleum Exporting Countries) had abundant spare capacity. However, the fundamentals of oil (supply/demand and oil inventories) have forced this consensus view to change. Century Management reserves the right to modify its current investment strategies and techniques based on changing market dynamics or client needs. The information provided in this report should not be considered a recommendation to purchase or sell any particular security. It should not be assumed that the sectors discussed were or will prove to be profitable, or that the investment recommendations or decisions we make in the future will be profitable. Forward-looking statements are not guaranteed. Past performance is not indicative of future results. The discussions, outlook and viewpoints featured are not intended to be investment advice and do not take into account specific client investment objectives. Information was obtained from third party sources which we believe to be reliable but are not guaranteed as to their accuracy or completeness.